So there are hundreds of blues guitar licks out there. 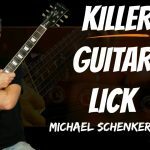 But there is one lick which is played by all the blues guitar greats…and in this lesson I’ll show you how you can start playing it too. It’s one of those blues guitar licks that sounds great almost anywhere in a blues solo and it’s an essential addition to your blues guitar lick library. Let’s dive in! 0:26 Learn to play possibly the most important and ‘must know’ blues lick there is! All the legends know it and use it. It’s an essential bit of blues guitar language. 0:42 Here’s the A minor pentatonic scale shape at the 5th fret. This is the scale that this lick (and dozens of other blues guitar licks you must know!) comes from. 1:04 Here’s the No. 1 blues lick you must know played so you can hear it. Sounds familiar eh? Let’s break the lick up and look at how you can play it. 1:57 I’ll jam over a 12 bar blues in the key of A now. See if you can spot the blues lick in my solo. You’ll hear how it works at all sorts of places throughout the 12 bar blues. 2:45 Blues Guitar Licks Variation. Here’s a basic variation you can do with this lick. It’s just a simple tweak, but can be handy for getting up to the higher notes on the neck in the sliding blues scale. 3:54 So what can you do with blues guitar licks like this one? Take them and practice using them that’s what! Experimentation is the key to making it work in your solos so don’t hesitate, jump in and see how you can use it right away.